If you attended the last AGM, you heard me say that I could not carry on as GECA President forever and this was always intended to be an interim position to help bridge a gap to a more permanent individual. Quite simply, my “real job” and my family obligations keep my wife and I swamped on a regular basis and it’s not fair to you as a resident, or GECA and our Board as an organization, that we can only run this post off the corner of our desks. The community deserves someone who can devote more time and attention to the needs of our neighbourhood, our website updates and properly scheduled and run Board meetings. Given that moral suasion hasn’t had the effect I’d hoped,I need to announce firmly now that Roxanne will be stepping down as Secretary and I will be stepping down as President no later than the next AGM in May. I strongly encourage you, if you have any time or interest in giving back to your community, to contact us before then to put your name forward for one of those posts. Between now and May we would be happy to run through the role with the new individual(s) and train you on the use of our website, where to access files in Dropbox, key Town contacts, and the like. I don’t want to simply leave GECA in a vacuum after the May AGM, but that is what will happen if nobody steps up. I sincerely hope we have a caring resident in our midst who has both the time and desire to help impact our community in a positive way. It’s that time again…GECA fees for 2018 are now due and we would appreciate payment by no later than April 30th. Reminder that you can pay on our website via the PayPal link. Once again they have remained static at $125 and we have some hard decisions to make as a community going forward. 2017 was the first year in a long time that we had to tap into our reserve funds to balance the budget…owing to much higher irrigation costs for our islands and boulevards (Town of Cochrane water charges) along with higher than expected landscaping costs. While we all chose to live here for its views, topography, natural beauty and much-more-prolific greenspace versus other communities… the reality is that costs money to maintain and beautify and we cannot simply continue charging the same fee that existed 15 years ago and expect to remain sustainable. Nor can we realistically or fairly expect our separate condo associations to pay any more towards GECA, or expect less in current fee rebates, when the lion’s share of boulevards and islands are being maintained in Gleneagles East and West. Your GECA volunteers have been diligently looking into options with the Town and with our landscaping options, trying to determine how to make our dollars go further. We would consider all options including a separate fee hike only for residents of Gleneagles East and West, or simply returning responsibility of all Gleneagles greenspace back to the Town, knowing that the quality and abundance of our beauty would likely not come close to the standards we have come to enjoy. Either way, the well is only a few years away from running dry and hard decisions will need to be made sooner than later—we welcome any and all of your suggestions or comments at president@geca.ca or secretary@gec.ca. The parcel (for those who aren’t familiar, it’s that large patch of vacant land between the Estates and the Vistas, near Highway 1A) has been sold and is once again up for development consideration. GECA and several passionate stakeholders from the various condo associations have successfully argued twice against development of this property (currently zoned Urban Reserve) and are prepared to do so again. Previous developers had been looking to purchase the land only conditional upon rezoning approval; however the current owner has purchased it with no such approval in place and is essentially rolling the dice with our current council, in spite of it being largely elected or re-elected on a “slow down growth” mandate. We believe that the current developer’s argument of “no development is NOT an option!” can be refuted quite simply with the fact that “no development is ABSOLUTELY an option”. Quite frankly, Cochrane has tons of existing and future-approved developments already on the books and if a home builder is that keen on putting their stamp on our town, there are plenty of other places to ply one’s trade without tearing up an existing 20+ year community where families have grown roots, wildlife have come to appreciate and seek shelter in the existing open spaces, and Mother Nature (touch wood) appears to have left our sleeping dragon of a mountain to rest peacefully for a decade or more. Why scratch its back and anger it? 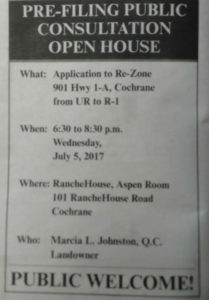 The developer has contracted Quantum Place Developments (“QPD”) to engage with our community in advance of making a formal application for rezoning and we expect to know more soon, as GECA and your condo associations are meeting regularly with QPD and the Town of Cochrane to obtain updates. In the meantime, we encourage you to visit www.qpdengage.ca/jonesestateland to join their mailing list and learn more about their plans as they become available. We also encourage you to actively remind your Mayor and Councillors about the platform on which they were elected and that they are under no obligation to approve any development on this land that does not appear to reflect the wishes or best interest of either our community or the Town at large. GECA and its Board will remain vigilant at all future engagements with both the developer and the Town in an effort to preserve our status quo. Hopefully you have not been victim to a break-in recently but many have. The serenity of Gleneagles and the friendliness of our neighbours makes it easy to let our guards down and leave our vehicles and homes unlocked…but sadly this is not 1960 Mayfield, it’s 2018 Cochrane and no community is immune to thieves and scoundrels anymore. Many homeowners have reported recent theft from vehicles and garages in our community, particularly over the Christmas season when out of town guests were visiting and when presents and valuables tended to appear in back seats more often than normal. You are strongly encouraged to keep your vehicles locked at all times, leave no valuables visible, keep the entry door from your garage to your home locked and, where possible, do not leave your garage door link from your vehicle in plain view. Once a thief is in your car, it’s just a push-button away from the inside of your garage and all those valuables, if you make it easy for them. If you are not already a member of our Facebook community, please join us at “GlenEagles Cochrane Block Watch Community Page”. It’s a closed group but just send moderator Mark Smith a quick FB message to let him know you live here and would like to join. “I’m dreaming of a white Christmas…” were the immortal words of Bing Crosby but if he’d walked through Gleneagles towards the end of December his dreams may have been shattered by the overwhelming presence of brown! Please dog owners, it’s not rocket science — be a responsible and respectful neighbour and dog owner and pick up after your pooch! Nobody’s suggesting you follow them 20-feet into the ravine to scoop the poop, if that’s where Fido decides to relieve himself (although that’s technically still the appropriate action) but at a bare minimum can we please remove it if it’s on the sidewalk, pathway or visible from those places? If you are looking for a way to give back to your community (but only after you agree to be GECA President or Secretary! ), Cochrane is seeking volunteers for “Public At Large” members for a selection of various committees. You can obtain more information by clicking here https://www.cochrane.ca/CivicAlerts.aspx?AID=410 and then selecting the relevant hyperlink to the committees page or phoning/e-mailing Lori McLain. By now you have all likely seen the coloured road signs announcing our upcoming AGM and would have received your combination “notice of meeting/voting proxy” delivered to your doorstep in early May. We hope to see as many of you there in person as possible, or at least represented by your voting proxy. The AGM is important because not only is it one of the few times per year we get to meet our neighbours in a social setting…it also allows you to discuss common issues and concerns and hear from your Board about how your $125 annual HOA fee is being spent. This year in addition to the usual Powerpoint on landscaping and financials, we will provide an update on the ongoing Jones Estate saga and be getting a visit from Fabrizio Bertolo of the Town of Cochrane, who will address your questions/comments about those giant green organic bins now sitting in all of our driveways and garages! Hopefully we all come away as experts in organics recycling. We would also love to hear from potential new blood! If you would like to let your name stand for President, Secretary, Board Director or simply offer to volunteer for any community/social events we may look to organize over the balance of 2017…please e-mail me back and let me know. We’ll also do an open call on the floor of the AGM. In my fall letter asking for your e-mail addresses, we got some great feedback on things that you’d like to see in the community. I will share some of those ideas at the AGM but as you will see, everything needs money and volunteers. I’d like to have an open discussion about community engagement and the reality of our existing annual fee which has not changed in a decade, effectively reducing our purchasing power by a significant amount over the same amount collected in 2008. As of May 5th we still had 190 households that had not yet remitted their annual HOA fee for 2017. That’s a relatively unsettling 20% delinquency rate, especially given our website is back up and running and it is now simple for snowbirds and other absentee owners to pay via Paypal. Please do your community a favour and make your payment as soon as possible—your timely contribution actually serves two purposes as it keeps our kitty where it needs to be to finance our spring/summer beautification costs, and saves us money in that there is less time spent chasing delinquent accounts. You can click on the “Pay Your Fees” tab on this website to go directly to the secure Paypal site to pay by credit card, or of course do things old school and send a cheque in the mail. Please take note of the signs posted in your subdivision for dates and times of upcoming TOC street sweeping efforts! If everyone can have their cars/RVs off the street for the periods indicated, we can rid our community of as much gravel as possible. Asthmatics, motorcyclists and your windshields thank you!! Please note the previously announced event below has been changed to May 13th. Maps of garbage drop off and volunteer locations are on the Facebook page link provided. A town-wide garbage clean up is planned again for this year to coincide with EARTH DAY April 22 from 10 am -12:30 pm. Organizers would love volunteer assistance with the various drop-off stations around town if you can donate your time to help keep our community beautiful! Hey everyone, in case you’ve missed it The Links of Gleneagles are now open for another season of golf so get up that protective netting if you normally do that kind of thing! Hopefully all our golfers are straight and true this season and nobody will end up with a dinged BBQ or patio window. The organics carts will start rolling next week. For updates and an instructional video we created for the program please check our Facebook page https://www.facebook.com/cochraneecocentre/ or our website www.cochrane.ca/organics. One more thing…..could you please help me in spreading the word about our organics play? Dreaming Alberta is a theatrical play (developed in collaboration with the Town of Cochrane) featuring four Albertans with diverse ethnic backgrounds (a First Nations Elder, a francophone Alberta lady, a young cowboy, and a Filipino girl) who meet in the forest because of a dream to rescue a girl who is in danger. The dream brings them all together in a particular place, and through conversation and vision they are able to solve the mystery. Dreaming Alberta is a magical story with a strong and clear message about the importance of diverting Organic Waste from the landfill with the help of the different cultures representing Alberta but also Canada. Come and join us on April 12th or 13th, 2017 at 7:00pm at the RancheHouse Theatre (101 Ranchehouse Rd.) in Cochrane. Dreaming Alberta is a free play for all Cochranites but please let me know if you are interested in coming so that I can reserve you some seats. Well, it took a little longer than we’d hoped but we’re excited to have our GECA website back up and running. Along with this new section for Resident Updates (which you can add comments or questions to at the bottom), we’ve beefed up our FAQ section and made it easy to pay your annual fees through Paypal by giving it a separate tab entirely. You’ll notice we’ve also included a tab for a “Photo Gallery” and we encourage you to e-mail us your best and favourite photos of GlenEagles scenery, wildlife or just relaxing or thrilling lifestyle shots and we will showcase them here! Effective April 1st, the Town is assuming control of the four parks in GlenEagles. Those of you who attended the last AGM may recall that while GECA and most of our residents did not want this, in the end we were not given a choice. Our only choice was to maintain responsibility for our boulevards, islands and other non-park green areas, which we have opted to do. Our current landscaping contractor is providing us a new estimate for the revised maintenance and we hope we can mostly offset the loss of the Town’s $40K annual reimbursement to maintain our boulevards and islands to the standards we have all come to expect in GlenEagles without a negative impact to the treasury. We are tentatively looking at the last week of May for this year’s AGM but will provide notice via this website as well as the usual signage along GlenEagles Drive. As I indicated in my previous letter, it would be wonderful if we had more of you willing to let your name stand for nomination to President, Secretary, or a member-at-large board position. Because GECA is solely a volunteer organization, we understand that lives outside of GECA need to take priority and as a result we rarely find ourselves with a full slate at any given BOD meeting, much less finding a mutually available time and date for a given BOD meeting. Putting a great community together is more of a “more the merrier” situation so if you have time to put your hat into the ring to either help run GECA from a Board perspective or assume a sub-committee role, we would love to hear from you! We know it looks pretty bad, that smashed hole in our fence just west of the GlenEagles East entrance. The Town has confirmed that repairs to the fence will occur when the ground has sufficiently thawed to allow crews to set the posts. We are still seeing people walking through the golf course on occasion, either alone or with dogs. Just a reminder that this is an act of trespassing and you could be charged. Please stay on the public paths in GlenEagles and don’t toboggan on the course. The Links of GlenEagles are a good neighbour to us but it is still their land. I’ve heard comments like “what’s the big deal as long as we’re being responsible”? Well for many reasons, not the least of which is the course’s liability should you get hurt even while being careful, or that your dog’s pee can still burn the links even passing through snow. The bottom line is this: private property is private property—we doubt you’d wander into a stranger’s back yard three houses down from you, just to “check it out in a responsible fashion”. There is a closed group on Facebook for GlenEagles residents to share any concerns about safety and security, lost and found, and any general issues that contribute to keeping our community a safe and enjoyable place to live by looking out for each other. The page can be accessed here https://www.facebook.com/groups/GlenEagles.BlockWatch.Page/ and then simply click “Ask to Join”. This continues to be a contentious issue for many GlenEagles residents. For those of you not aware, the “Jones Estate” (as its commonly referred) is the four acre parcel of open land at the top of GlenEagles, above the Villas and between one end of the Estates and one end of the Vistas. The land is currently zoned as Urban Reserve and in the opinion of many should remain so. The executor of the property is trying—so far unsuccessfully—to have it rezoned so that 16 or more new homes can be built on the parcel. This will maximize the market value of the land so that the various charities to which the land was bequeathed can enjoy their donations. It’s an admirable effort of the executor on behalf of the charities; however GECA believes there is a better way to work with various levels of government to ensure the charities get a reasonable value for the land while it remains a serene greenspace forever. So, if you live in GlenEagles Landing or the Close, you might be asking…why should I care? Well there are a number of reasons why no resident of GlenEagles should be in favour of renewed development in our community that has already been deemed by previous Town administration and council as “complete”. For starters, a major new development will be a royal pain for our friends in the Vistas, who will be fighting to safely access their properties, park and mailboxes on a daily basis while contending with crews, dump trucks, cement trucks and the like for as long as the development takes. The dirt and debris of new construction won’t be just limited to the Jones Estate…it will be tracked all through Vistas and we all know how windy it gets in GlenEagles—one good gust and a backyard in the Close or GlenHaven might find itself with some unwanted insulation or roofing shingles! We know that geotechnical issues are a huge concern in GlenEagles, with so many properties over the last two decades experiencing internal groundwater issues and some kind of slumping either minor or major. To “poke the bear” so to speak, with a brand new round of heavy construction on a known unstable slope, seems like folly. And finally, what of all the wildlife we have come to enjoy in our community and often right in our own front yards and helping to make GlenEagles so unique? Closing off that current green space/safe-haven/corridor for wildlife moving from Glenbow Provincial Park through to acreages across Highway 1A might permanently alter the wildlife routes through GlenEagles that currently allow us to see foxes, deer and coyotes up close. GECA opposes any new development of the Jones Estate but is willing to work with all levels of government to find a win-win solution. No public hearing date has yet been set for the current application before council, but when we get details on that we will provide it by way of another Resident Update on this website. The Cochrane Planning Commission is meeting this Wednesday, March 15th at the Cochrane Ranchehouse chambers at 6:30 to discuss the application. This is not a public hearing so no comments from the gallery will be accepted, but if you are interested in attending you are welcome. More community get togethers, BBQ’s, etc. As you continue to enjoy your GlenEagles home, please submit any ideas you have for community improvement to us and we will do our best to ensure the best bang for everyone’s buck and continue to make this a fantastic place to raise a family or retire. Your comments and questions are welcome below, just click on the “Leave a Comment” box at the top right of this blog. Please note there will be a slight delay while they are moderator-approved—this is only required once after which you will be able to post freely from the same e-mail address.